There’s been a flurry of news about genuinely new technologies for bikes, mostly involving digital electronics. These stories are seductive because they fulfil our desire for an exciting, better future. I know this all too well – I earned a living from writing such stuff for more than a decade. One downer is that most of them are chimeras. They never materialise. In Britain it’s known as the Tomorrow’s World effect, after a TV programme that, each week, highlighted innovations but which were never seen again. Of course, that’s a little unfair. While the novel devices and gadgets don’t themselves become commercial products, some of the underlying technologies are picked up and find their way into successful, popular designs. So that’s my excuse for showcasing a few of the innovations for cyclists that have floated across the internet recently. They may disappear, they may become mainstream or the ideas embedded within them may surface in a completely different manifestation. Whatever – they’re fun. 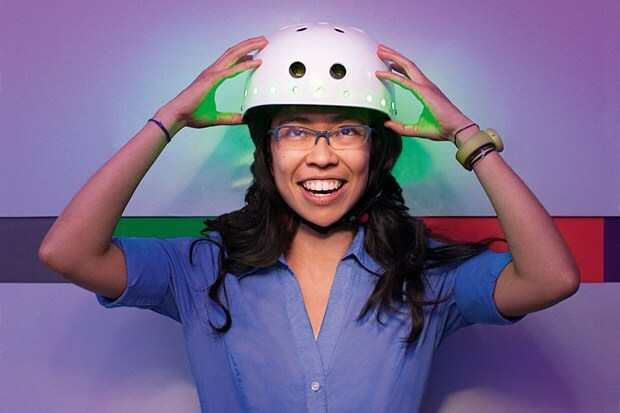 Wired has featured a helmet that, allegedly, can detect brainwaves. It’s a student project at MIT and it has been suggested that it could be used to detect the intentions of cyclists and trigger the operation of digitally controllable electronic components. So it could, with a single thought, illuminate a left-turn light. Meanwhile, Cambridge Consultants have turned a smartphone into a virtual gearlever and so do away with human thought altogether, according to my old editor Paul Marks at New Scientist. With its internal accelerometer, a prototype app and a Bluetooth connection to the electronic gear mech, the mobile phone makes the chain shift between cogs automatically and maintains a steady cadence for the rider. 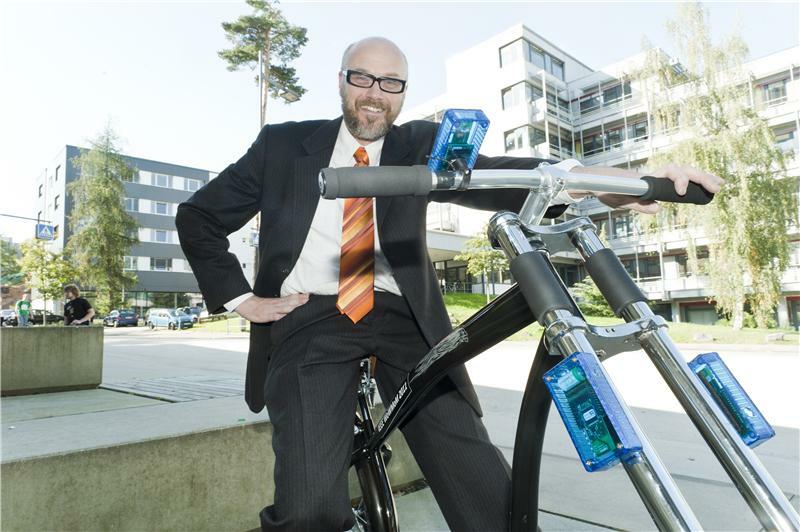 If the Bluetooth connectivity tech from Cambridge Consultants is allied with MIT’s helmet they could be harnessed by Saarland University’s digital braking system. Then all a rider would need to do would be to think about slowing and, hey presto, the brakes would be applied, the tyres would never skid because the wheels would have a digital anti-lock function and the gearing would change down automatically and make it easier to start pedalling. 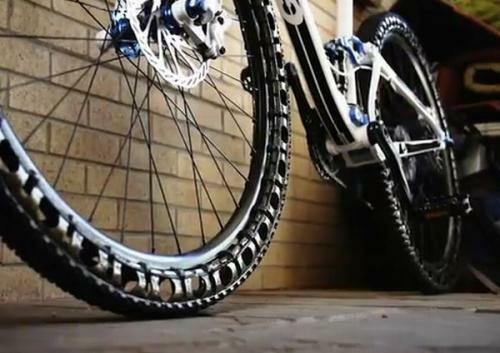 Battery-powered enhancements are not for everyone so how about a puncture-proof tyre? Britek Tire and Rubber came up with an air-less car tyre almost a decade ago but have not yet succeeded in going mainstream with it. Now they hope that mountain bikers might adopt it. I’d love to hear from anyone who has ridden these tyres. 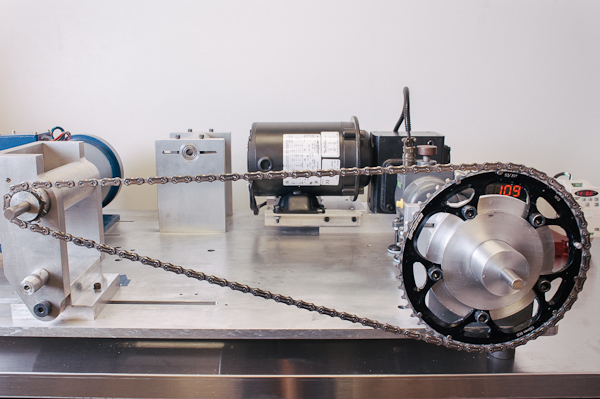 Finally, something that genuinely deserves to be supported by the cycle industry – an independent lab for assessing the friction of all bicycle components. Friction pales in comparison to drag in terms of wasting a cyclist’s energy but, with aerodynamics becoming reasonably well understood, this new facility should become very busy as riders want to shave even more seconds off their competition times. That’s the future. Maybe. Waddyou reckon? This entry was posted on 15/11/2012 at 1:53 pm and is filed under Brakes, Electronics, Friction, Helmets, Tires, Tyres, Uncategorized. You can follow any responses to this entry through the RSS 2.0 feed. You can leave a response, or trackback from your own site.